How can you get digital communication to blend in to a 19th century environment? This was the challenge that Jernhusen Media presented to SMS. 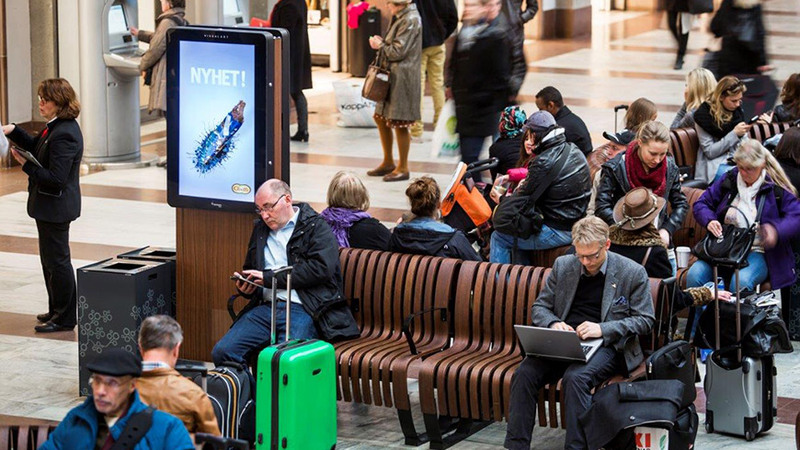 Jernhusen Media is responsible for media exposure in several railway stations and travel centers across Sweden. At Stockholm Central Station, where up to 200,000 travelers pass through every day, they wanted to equip the historic central hall from the 1800s with digital advertising and information screens. The goal right from the start was for the screens not to stand out, but to blend in to the environment. We created a specially designed version of the SMS Cabinet Indoor Totem from our Tailored line. Four 40” screens were mounted back to back and fitted with a mahogany foil that matches the wood on the benches in the central hall. Because it is a fast-paced environment, a transparent protective film and kick protection were added to protect the installation from stains, marks and external damage. Stockholm Central Station expanded their information and advertising space whilst the central hall kept its 19th century charm. Read about SMS Cabinet Indoor Totem here.